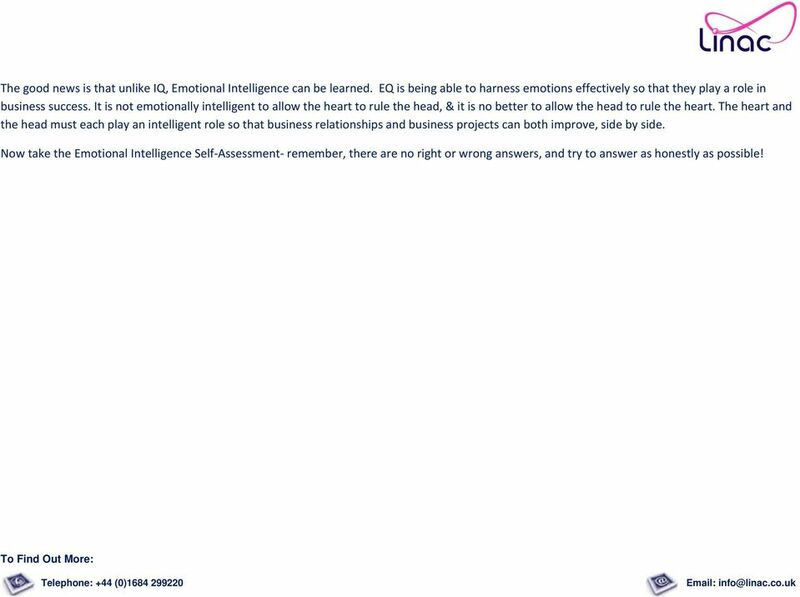 Download "Emotional Intelligence Self Assessment"
2 Emotional Intelligence When people in the workplace do not act with Emotional Intelligence (EQ) the costs can be great: low morale, bitter conflict and stress all limit business effectiveness. There is also the financial cost of litigation when people complain of being bullied, intimidated, and exploited. 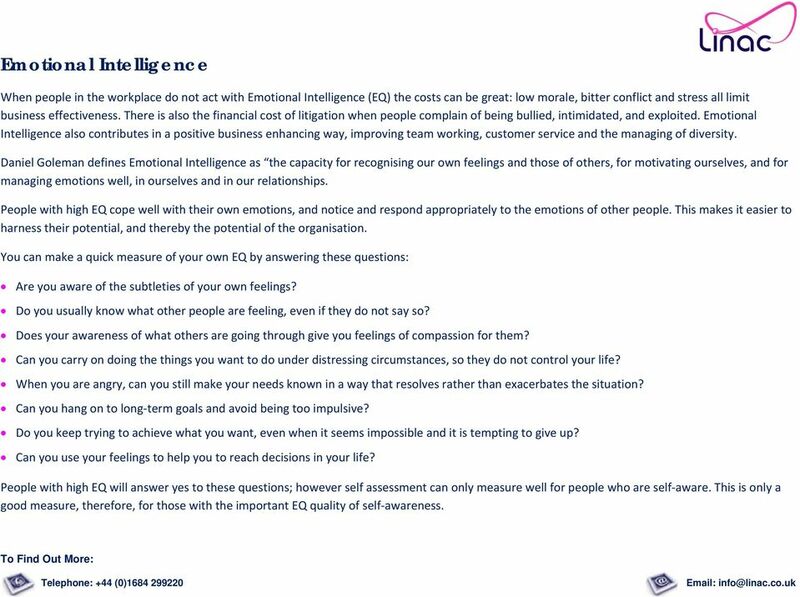 Emotional Intelligence also contributes in a positive business enhancing way, improving team working, customer service and the managing of diversity. Daniel Goleman defines Emotional Intelligence as the capacity for recognising our own feelings and those of others, for motivating ourselves, and for managing emotions well, in ourselves and in our relationships. People with high EQ cope well with their own emotions, and notice and respond appropriately to the emotions of other people. This makes it easier to harness their potential, and thereby the potential of the organisation. 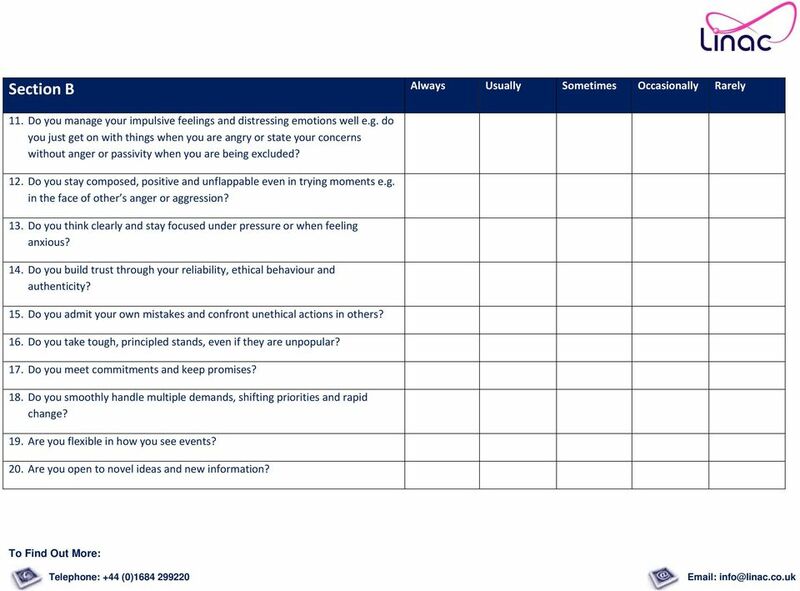 You can make a quick measure of your own EQ by answering these questions: Are you aware of the subtleties of your own feelings? Do you usually know what other people are feeling, even if they do not say so? Does your awareness of what others are going through give you feelings of compassion for them? Can you carry on doing the things you want to do under distressing circumstances, so they do not control your life? When you are angry, can you still make your needs known in a way that resolves rather than exacerbates the situation? Can you hang on to long term goals and avoid being too impulsive? Do you keep trying to achieve what you want, even when it seems impossible and it is tempting to give up? Can you use your feelings to help you to reach decisions in your life? People with high EQ will answer yes to these questions; however self assessment can only measure well for people who are self aware. This is only a good measure, therefore, for those with the important EQ quality of self awareness. 3 The good news is that unlike IQ, Emotional Intelligence can be learned. EQ is being able to harness emotions effectively so that they play a role in business success. It is not emotionally intelligent to allow the heart to rule the head, & it is no better to allow the head to rule the heart. The heart and the head must each play an intelligent role so that business relationships and business projects can both improve, side by side. Now take the Emotional Intelligence Self Assessment remember, there are no right or wrong answers, and try to answer as honestly as possible! 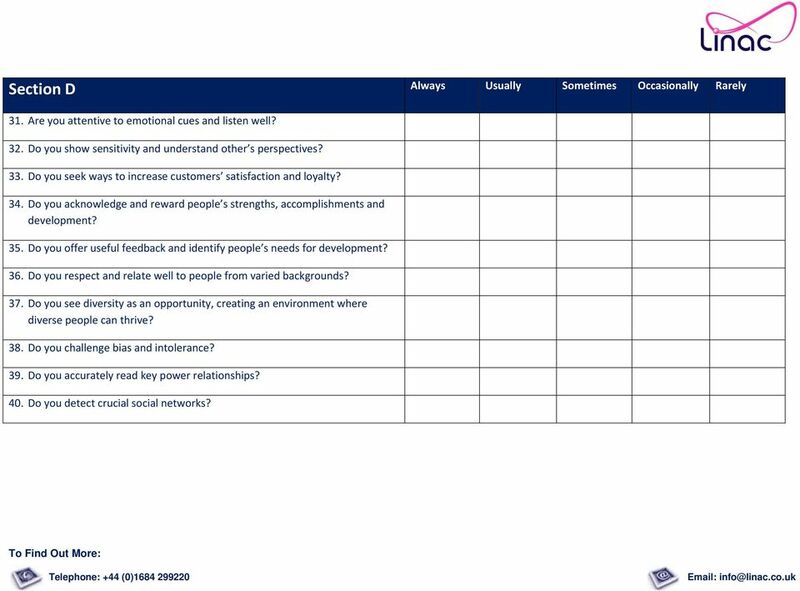 4 Emotional Intelligence Self-Assessment The following questions are designed to help you establish just how aware you are of your emotional responses and how well you use your emotional intelligence. 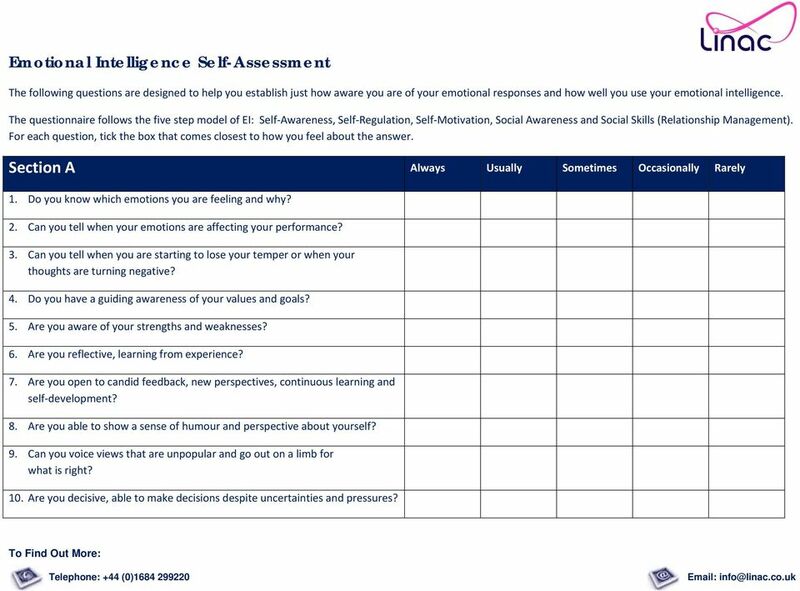 The questionnaire follows the five step model of EI: Self Awareness, Self Regulation, Self Motivation, Social Awareness and Social Skills (Relationship Management). For each question, tick the box that comes closest to how you feel about the answer. Section A Always Usually Sometimes Occasionally Rarely 1. Do you know which emotions you are feeling and why? 2. Can you tell when your emotions are affecting your performance? 3. Can you tell when you are starting to lose your temper or when your thoughts are turning negative? 4. Do you have a guiding awareness of your values and goals? 5. Are you aware of your strengths and weaknesses? 6. Are you reflective, learning from experience? 7. Are you open to candid feedback, new perspectives, continuous learning and self development? 8. Are you able to show a sense of humour and perspective about yourself? 9. Can you voice views that are unpopular and go out on a limb for what is right? 10. Are you decisive, able to make decisions despite uncertainties and pressures? 5 Section B Always Usually Sometimes Occasionally Rarely 11. Do you manage your impulsive feelings and distressing emotions well e.g. do you just get on with things when you are angry or state your concerns without anger or passivity when you are being excluded? 12. Do you stay composed, positive and unflappable even in trying moments e.g. in the face of other s anger or aggression? 13. Do you think clearly and stay focused under pressure or when feeling anxious? 14. Do you build trust through your reliability, ethical behaviour and authenticity? 15. Do you admit your own mistakes and confront unethical actions in others? 16. Do you take tough, principled stands, even if they are unpopular? 17. Do you meet commitments and keep promises? 18. Do you smoothly handle multiple demands, shifting priorities and rapid change? 19. Are you flexible in how you see events? 20. Are you open to novel ideas and new information? 6 Section C Always Usually Sometimes Occasionally Rarely 21. Do you bounce back quickly after a setback? 22. Can you kick start yourself into action when appropriate? 23. Are you results oriented, with a high drive to meet your objectives and standards? 24. Do you set challenging goals and take calculated risks? 25. Do you learn how to improve your performance? 26. Do you readily make personal or group sacrifices to meet a larger organisational goal? 27. Do you use the group s core values in making decisions and clarifying choices? 28. Are you ready to seize opportunities? 29. Do you pursue goals beyond what is required or expected of you? 30. Do you persist in seeking goals despite obstacles and setbacks? 7 Section D Always Usually Sometimes Occasionally Rarely 31. Are you attentive to emotional cues and listen well? 32. Do you show sensitivity and understand other s perspectives? 33. Do you seek ways to increase customers satisfaction and loyalty? 34. 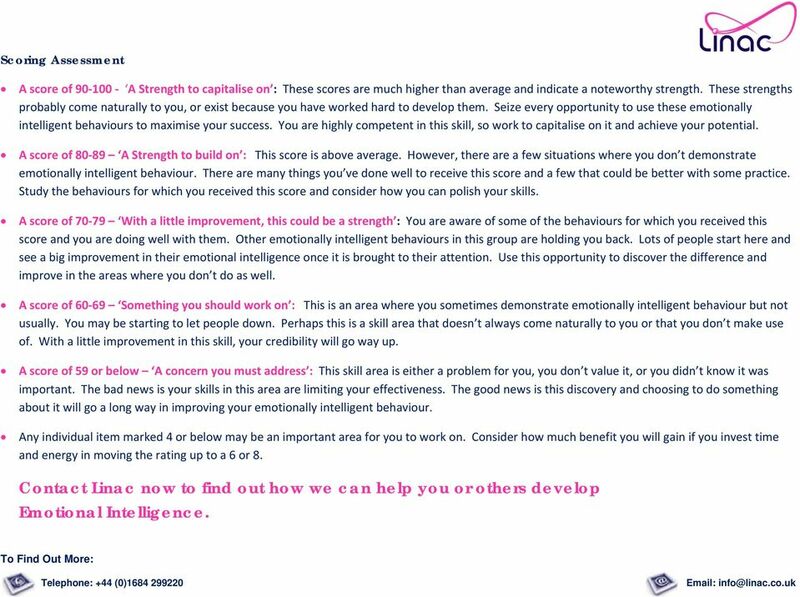 Do you acknowledge and reward people s strengths, accomplishments and development? 35. 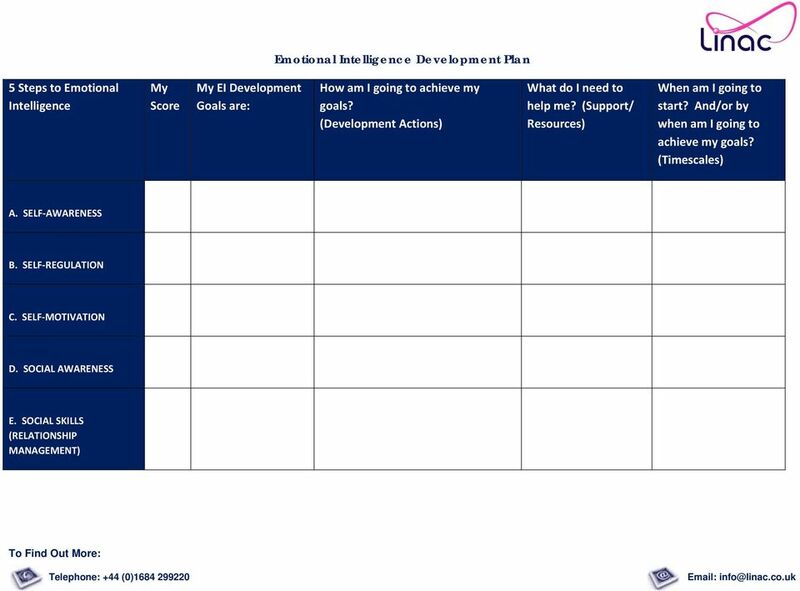 Do you offer useful feedback and identify people s needs for development? 36. Do you respect and relate well to people from varied backgrounds? 37. Do you see diversity as an opportunity, creating an environment where diverse people can thrive? 38. Do you challenge bias and intolerance? 39. Do you accurately read key power relationships? 40. Do you detect crucial social networks? 8 Section E Always Usually Sometimes Occasionally Rarely 41. Are you able to raise morale and make others feel good? 42. Are you able to demonstrate empathy with others feelings? 43. Do you listen well, seek mutual understanding and welcome sharing of information fully? 44. Do you lead by example? 45. Do you recognise the need for change and remove barriers? 46. Do you handle difficult people and tense situations with diplomacy and tact? 47. Do you cultivate and maintain extensive informal networks? 48. Do you balance a focus on task with attention to relationships? 49. Do you promote a friendly, co operative climate? 50. Do you model team qualities like respect, helpfulness and co operation? Marking your Answers: Now give yourself 10 points for Always, 8 points for Usually, 6 points for Sometimes, 4 points for Occasionally and 2 point for Rarely. Add up your total for each section and transfer the scores. 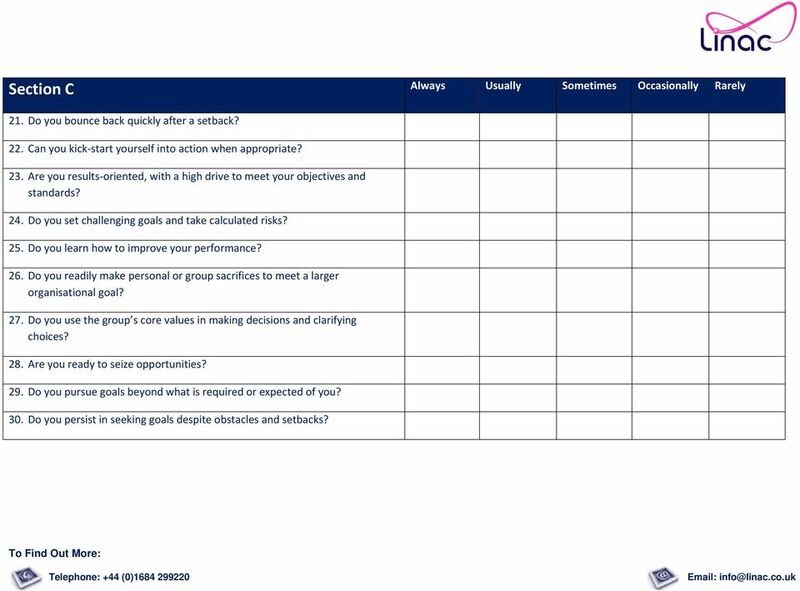 10 Scoring Assessment A score of A Strength to capitalise on : These scores are much higher than average and indicate a noteworthy strength. These strengths probably come naturally to you, or exist because you have worked hard to develop them. Seize every opportunity to use these emotionally intelligent behaviours to maximise your success. You are highly competent in this skill, so work to capitalise on it and achieve your potential. A score of A Strength to build on : This score is above average. However, there are a few situations where you don t demonstrate emotionally intelligent behaviour. There are many things you ve done well to receive this score and a few that could be better with some practice. 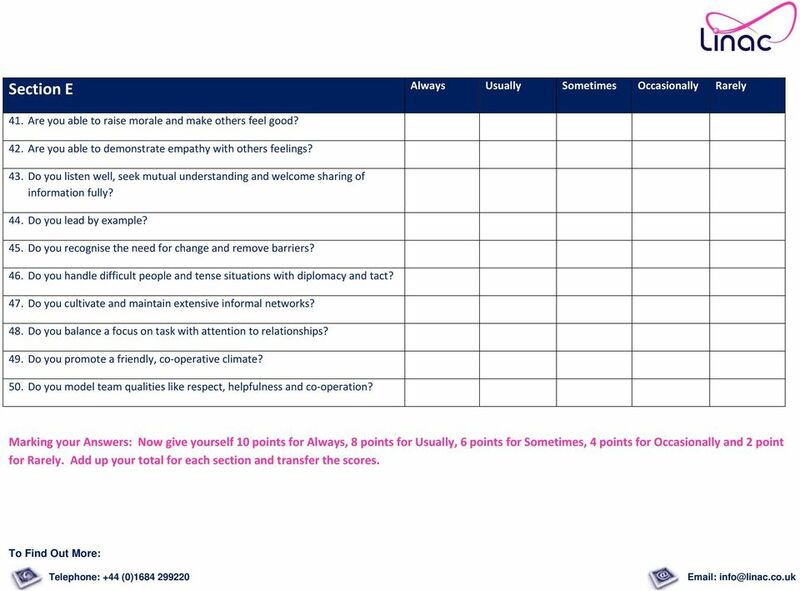 Study the behaviours for which you received this score and consider how you can polish your skills. A score of With a little improvement, this could be a strength : You are aware of some of the behaviours for which you received this score and you are doing well with them. Other emotionally intelligent behaviours in this group are holding you back. Lots of people start here and see a big improvement in their emotional intelligence once it is brought to their attention. Use this opportunity to discover the difference and improve in the areas where you don t do as well. A score of Something you should work on : This is an area where you sometimes demonstrate emotionally intelligent behaviour but not usually. You may be starting to let people down. Perhaps this is a skill area that doesn t always come naturally to you or that you don t make use of. With a little improvement in this skill, your credibility will go way up. A score of 59 or below A concern you must address : This skill area is either a problem for you, you don t value it, or you didn t know it was important. The bad news is your skills in this area are limiting your effectiveness. The good news is this discovery and choosing to do something about it will go a long way in improving your emotionally intelligent behaviour. Any individual item marked 4 or below may be an important area for you to work on. Consider how much benefit you will gain if you invest time and energy in moving the rating up to a 6 or 8. 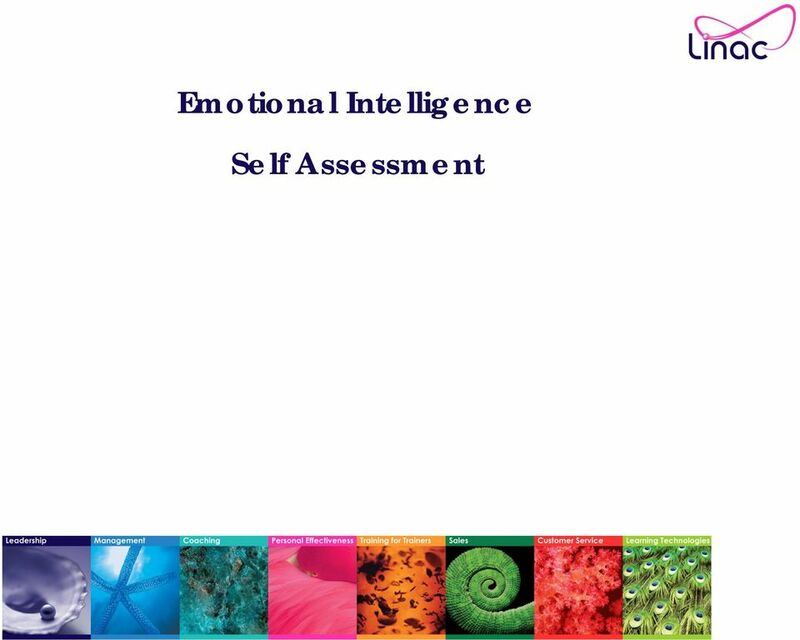 Contact Linac now to find out how we can help you or others develop Emotional Intelligence. RESULTS REPORT FOR: NAWAF ALSUNAID TEST COMPLETED: November 7, 2016 RETEST COMPLETED: November 21, TalentSmart, Inc.
Eileen s notes Chapters 5-12 Principle-Centered Leadership by Stephen Covey Chapter 5 A Break With The Past Covey s goal in Principle-Centered Leadership is to create a paradigm shift in management training. FACE TO FACE SELLING SKILLS MODULE 3 SALES COMMUNICATION SKILLS Pre-Tutorial ACCOUNT MANAGER S WORKBOOK Welcome to Module 3 Sales Communication Skills Welcome to Module 3 of Face to Face Selling Skills. The following are examples of questions Tell me about a difficult decision that you have made. Tell me about an unpopular decision you have made.